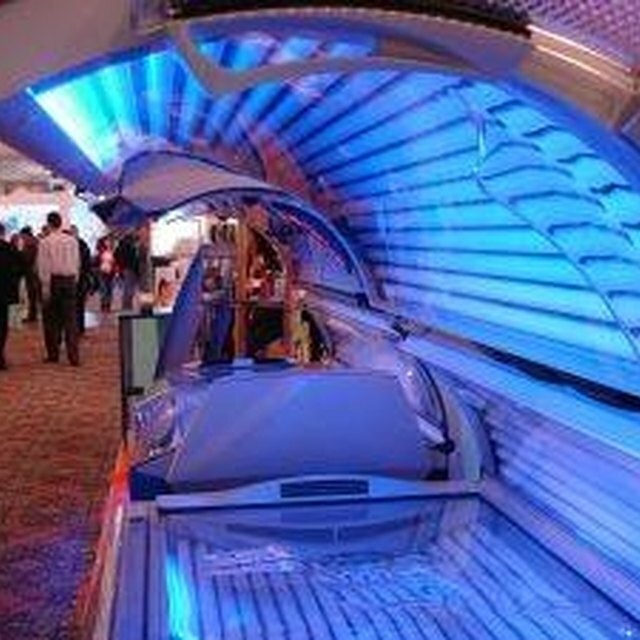 The inside of a tanning bed. 1 How Does a Tanning Bed Work? The Health Physics Society defines ultraviolet (UV) light, or UV radiation, as the 100-400 nm portion of the electromagnetic spectrum, between visible light and x-rays. 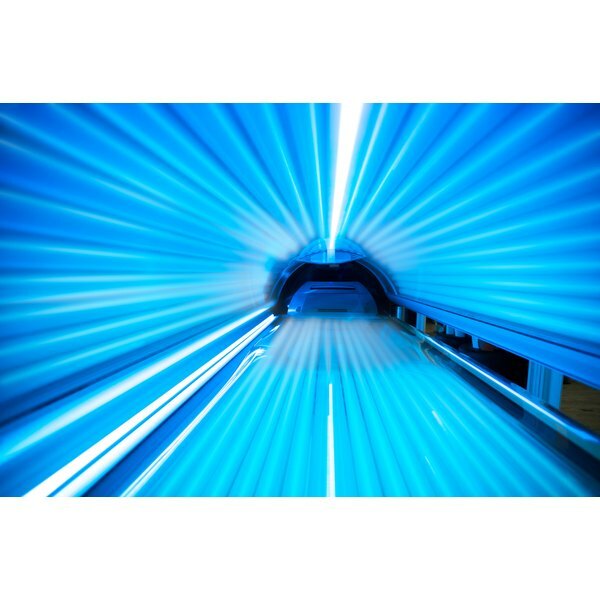 The primary source of UV radiation is the sun, but we can be exposed to UV radiation through other artificial means, such as tanning beds, halogen, or black lights. Sun exposure is beneficial and necessary for vitamin D synthesis, but too much exposure can be harmful to the skin and overall health. UV light consists of UVA, UVB, and UVC rays, or wavelengths. UVC rays are absorbed in the earth’s atmosphere and are therefore harmless, however, both UVA and UVB reach the surface and affect those of us living here. Historically, UVB was thought to be the only destructive UV ray, because it is more capable of causing skin damage than UVA, but the amount of UVB ray exposure varies by time of day, season and location. More recently, UVA has been discovered to penetrate more deeply into the skin to cause damage, and it also exacerbates the effects of UVB rays. UVA rays are more commonly encountered because they are present all day, all year round. Both UVA and UVB rays penetrate the skin and react with a chemical called melanin. Too much exposure to these rays will kill the top layer of cells. Normally, melanin protects the skin by absorbing the UV rays and converting them into heat energy. As the rays are absorbed, the skin darkens. Damage occurs, however, when the amount of UV absorbed by the skin cells exceeds melanin’s protection. The UV radiation damages the skin cells’ DNA, which triggers enzymes to try to repair the damage. The enzymes are not always successful in repairing the DNA, however, and mutations may occur, increasing the likelihood of cancer and other problems. UVA overexposure may cause toughening of the skin, wrinkling, loss of elasticity, sun spots, cataract formation, and even suppression of the immune system. Overexposure to UVB rays has been known to cause harmful effects such as sunburns, cataracts and the development of skin cancer. Contrary to some belief, tanning is actually considered skin damage just as much as a sunburn, and both increase the risk of developing one of the three main types of skin cancers: basal cell carcinoma, squamous cell carcinoma, and melanoma. The Ultraviolet Index is a forecast developed by the National Weather Service and the Environmental Protection Agency to inform people what the expected amount of UV light to hit the earth’s surface will be when the sun is at its highest. The forecast depends on the cloud cover, sun elevation and ozone amount and is rated on a scale of 0 to 10+. Anything above 5 is considered moderate or higher and extra care should be taken to protect skin and eyes from overexposure. Pay attention to the UV Index and limit exposure to the sun during peak hours, 10:00am to 4:00pm. Protect skin and eyes by wearing sunglasses and sunscreen with a Sun Protection Factor (SPF) of 15+ and a UVA blocker. Wear hats and protective clothing and avoid tanning beds and other artificial UV radiation sources.